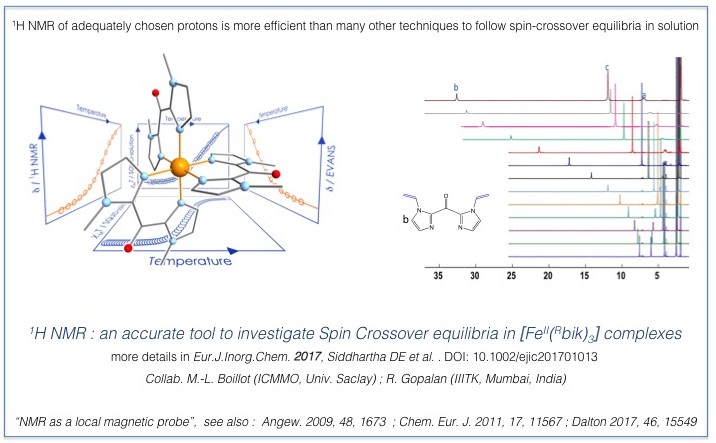 NMR spectroscopy -in solid state or solution- not only gives acces to structural information but it also provides valuable magnetic information about paramagnetic molecules or any paramagnetic systems. For instance, NMR can help elucidating the local structure of complex materials (such as Prussian blue analogs as intercalation materials for Li-ion batteries). NMR also allows following spin conversion equilibria in solution efficiently. XAS (X-ray absorption spectroscopy) and XMCD (X-ray magnetic circular dichroism) are ideal local probes to investigate the metal ions’ oxidation states, symmetries and magnetic contributions. Indeed, the chemical selectivity of XAS allows an independent measuring of each metal ion’s magnetic properties and a differentiation of the spin and orbit magnetic contributions.